In hindsight, I suppose I could have gone to Panorama Mesdag on the same day as when I went to the Escher museum. I could have saved a few euro. I was curious about it since I noticed it is usually part of ticket packages for tourist attractions around The Hague. But the building did not have a lot of clues as to what was inside. 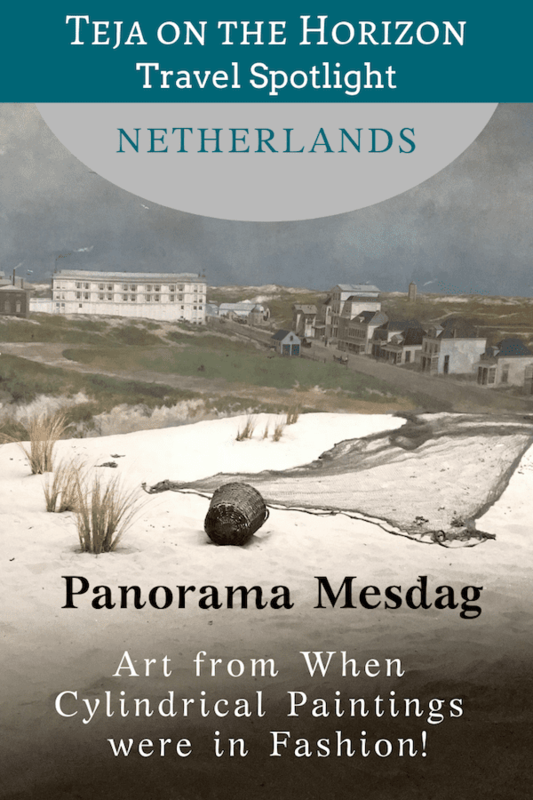 What, pray tell, was a ‘panorama mesdag‘? Gregg said that it was cool, and something I’d like, but couldn’t quite articulate what the panorama was. ‘A painting of the beach,’ he said. Why is this painting of the beach so important, though? But later on, one of my Dutch colleagues explained that the painting was huge! That it was painted all around, and made to look real, so that you felt as if you were really there. That there was a skylight so that the scene appears to change through the day depending on the weather outside. Well, that does sound like something I would like. How curious! 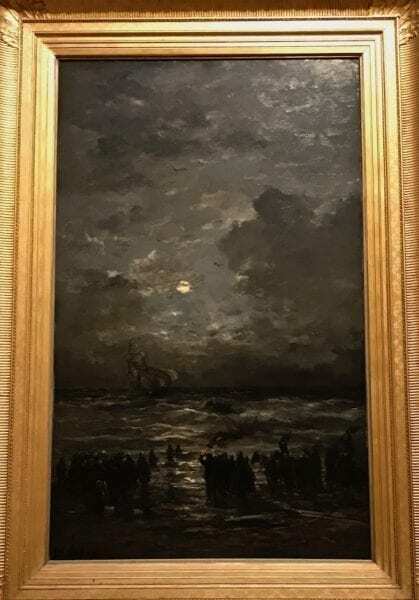 And so it happened that on my last attempt to visit a Den Haag museum, I still failed to go see Vermeer, and compounded my art heresy by preferring Mesdag. The Panorama Mesdag is open daily, with some exceptions (see website). The museum did not just host the panoramic painting. Hendrik Mesdag (and his wife) had been an active painter, and had amassed a large collection of artwork. Some of these were exhibited in the ground floor rooms of the museum, and there was a section devoted to his wife’s work as well. But to my pleasant surprise, I discovered that Mesdag had specialised in a subject dear to my heart – the sea. 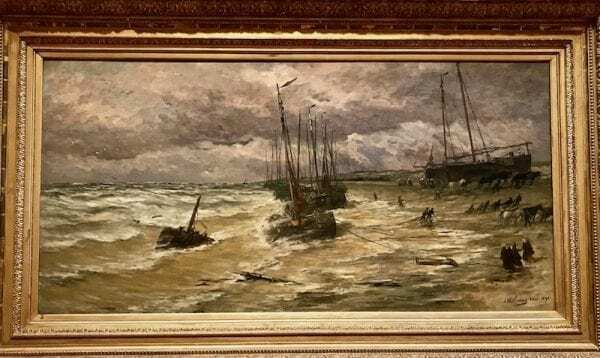 He had based himself in Scheveningen, and many of his paintings depicted the beachside. And so it was these paintings that I spent the most time admiring. Villagers gathering on Scheveningen beach, ready to assist an unfortunate foundering ship. Sailing boats on calm water. The moon shone brighter on canvas than can be conveyed by this picture. Nostalgia. The Scheveningen fishing community working together to beach the boats, in a time before the construction of a harbour. To my layman’s eyes, he was quite good. I say so because he truly captured the feel of the sea in her many moods, under bright moons and sunsets casting light across the flood of water. Keep your paintings of gardens, and let me have one of the sea. One painting in particular captured my imagination. It was a harrowing scene, a ship foundering amidst choppy sea, within sight of shore. In the moonlight, villagers had gathered on the beach, watching – fearing. A few intrepid souls went so far as to wade into the water. A lifeboat, almost invisible upon the billows, determined to reach the ship to rescue the doomed sailors. The tension and drama was palpable. Another painting was interesting enough for me to read the text explaining it. It was a scene of villagers, hauling on ropes together to beach the fishing boats. Lines of men, pulling altogether, as the boats tilted and weaved across the shallow breakers. Mesdag was painting so many scenes of Scheveningen, because a harbour was to be built there. There was to be an upgrade of the fishing industry. Bigger ships, going further to sea – the transition to industrial fishing was happening. It would surely obliterate the traditional fishing community in Scheveningen. Today, it’s difficult to think of the Netherlands as anything other than urban and modern. Difficult to imagine that there would have been villages at some point in time, doing village things with a rural sort of culture. And that there might be Dutchmen who wished not to have those old ways lost to modernity. But some – Mesdag included – were opposed to this harbour project. 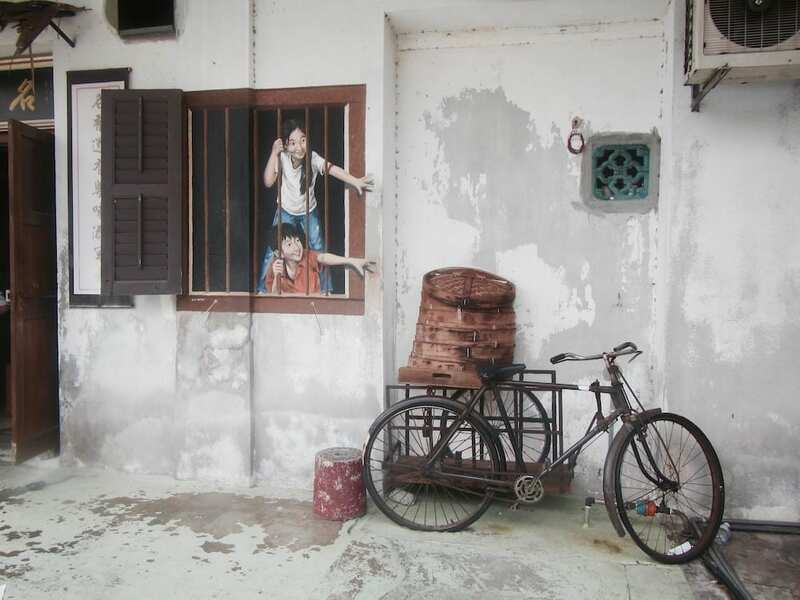 So he painted the beaches and the village often, because he knew it would soon be gone. Aside from Mesdag’s own works, the museum also hosts an exhibition of other artists’ work. When I was there, they were displaying the work of de Josselin de Jong. Now, I had never heard of Mesdag, let alone de Josselin de Jong. He was known as a portrait painter, painting prolifically on commission. But the part of the exhibition that was far more interesting to me, was what he painted when he was not doing it for the money. He did not paint still life, not pretty picnic scenes. Not dancers or sensual women, and not even nature scenes. No, none of those typical art images. He painted ordinary, working class people. The common, real streets. 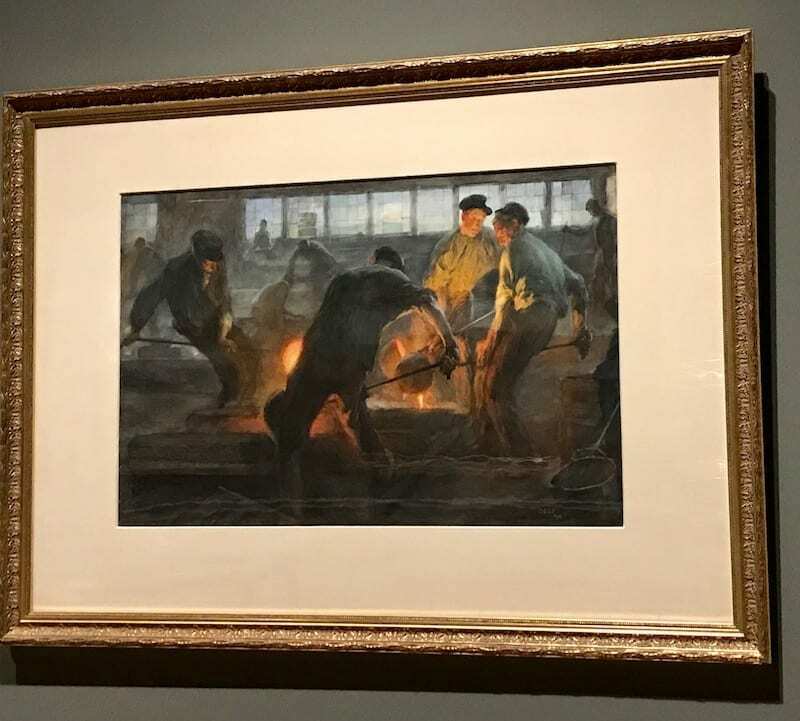 Foundry workers, in hard labour. He did not paint these scenes in a way meant to provoke a particular reaction from the viewer. Not, for example, as a liberal artist of leisure, feeling a saviour’s sense of pity or romance for ‘the plebeians’. No, he painted them as an equal. From ‘street level’, with a frankness that conveyed the burden but also the nobility of work. These were the paintings he preferred to exhibit, over his portraiture and other work. A time when the world was simultaneously unequal, yet equal. It was unusual enough that it made me look closer, and read the text to find out who he was. Most Malaysians (and perhaps generally Southeast Asians), have post-colonial exaggerated beliefs about Europeans being superior in every way. However, unlike the mainstream, I know that when the Europeans left their lands to colonise others, and lord it over the colonised peoples, their own lower classes back home often had an equally sorry life. It’s just that the colonised peoples never saw those Europeans. There are benefits to being a literature and history nerd. A snippet accompanying de Josselin de Jong’s portrait of his own mother caught my attention such that I came back to it after viewing the panorama upstairs. She was a single mother raising her seven sons in deep poverty, after her husband committed suicide. Pieter, the eldest, was able to study art only because of a royal scholarship. He sent money home as soon as he could. This is one of the reasons why he produced so many portraits. The burden of a single mother, and the duty of the firstborn to all his siblings. If I had not known who the snippet was talking about, I would have thought, what a familiar, Asian story. I shared that snapshot on my Facebook wall, as a reminder to my peers that once upon a time, the Dutch could literally relate to those things we usually think of as ‘our’ struggles. 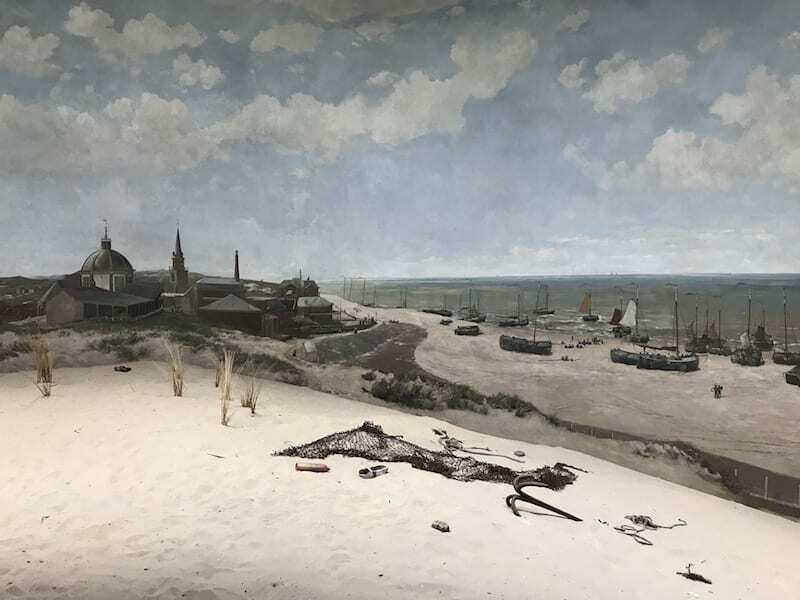 It was time to actually view the crown jewel itself, the Panorama Mesdag. Located at the upper level, you have to ascend some winding stairs, and emerge in the middle of a cylindrical room. Cylindrical room, for a cylindrical painting. And there it was, wrapped all around the chamber. 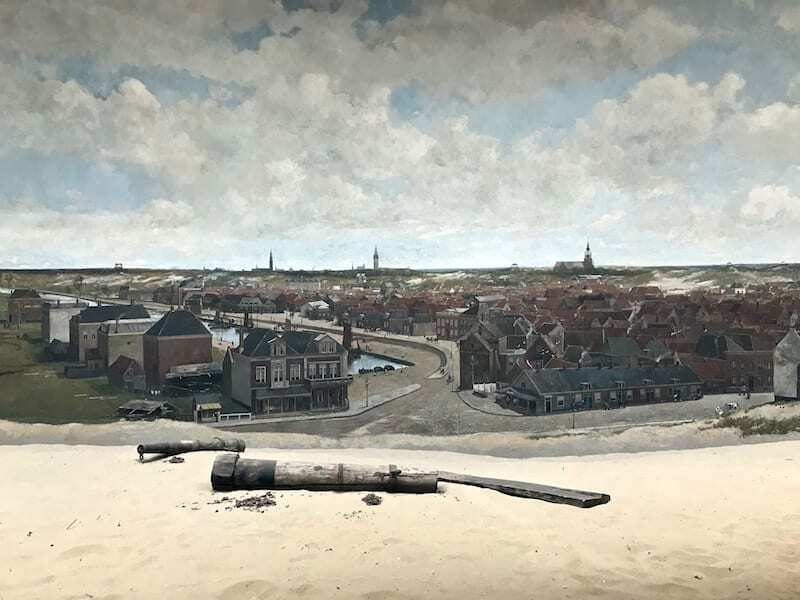 A 360° scene of old Scheveningen, as if you stood there for real. It’s really something that has to be experienced in person. That day the sky was overcast, so the clouds of the painting attained a heavy prominence. 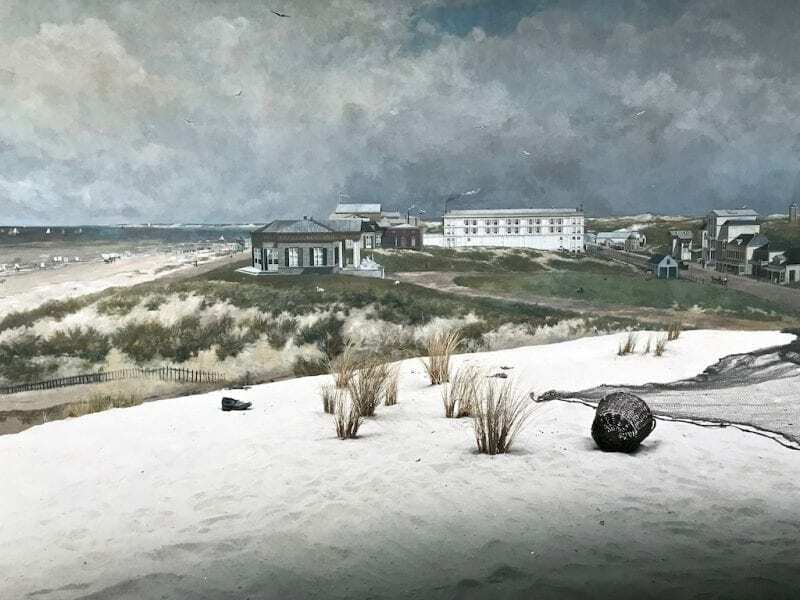 A diorama of beach dunes and flotsam had been added between the viewer and the actual panorama, constructed to blend seamlessly into the scene – as if it were part of the painting. Also called a ‘cyclorama‘ (isn’t it such a wonderfully quaint term? ), panoramic paintings were a significant undertaking. The painting part itself is daunting. And then there’s the part where you actually have to mount it and display it to its desired effect. You had to build a building specifically for this purpose! But in the middle of the 19th century, it was all the rage. Remember, this was a time before photography. If you wanted to look at something without it actually being present in front of you, you had to have a painting of it. The panorama took that up a notch – now you could feel like you were really someplace else, without going there! It was the ‘VR headset’ of the 19th century. Unsurprisingly, European audiences went nuts over it. Properly important European cities had to have at least one, to keep up with the cyclorama fad. 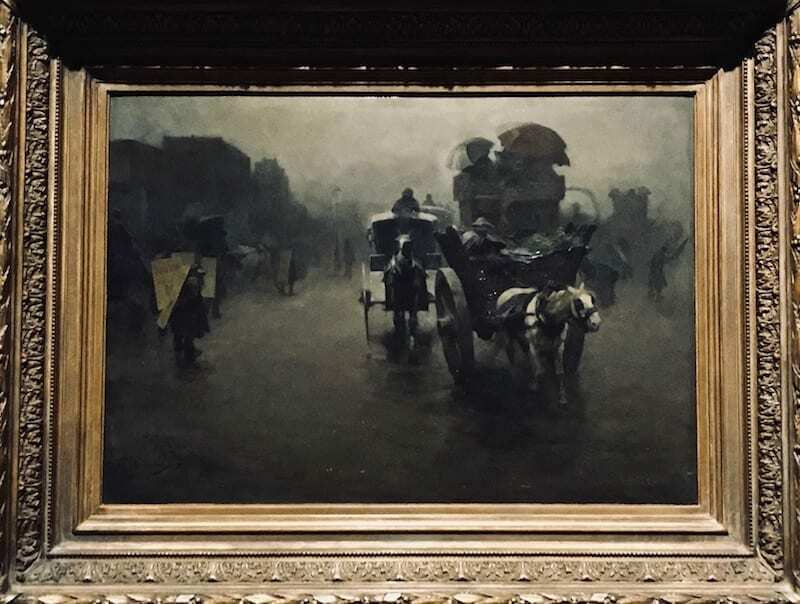 And so, in the true spirit of capitalism, a Belgian company jumped on the bandwagon in 1880 and commissioned Mesdag to produce one for the Hague. 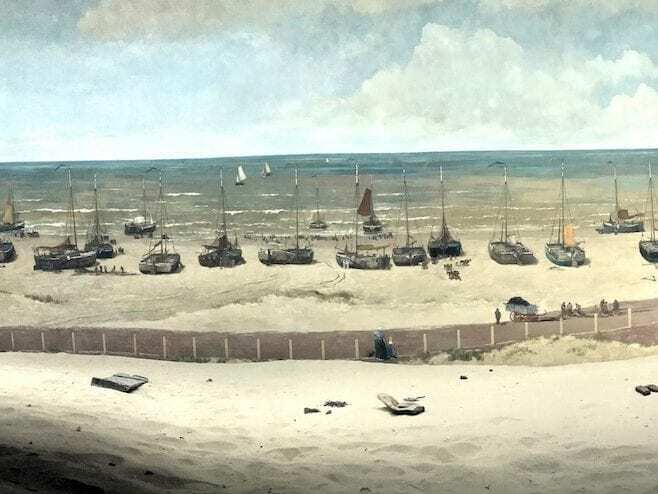 A year later, the Panorama Mesdag was completed. Alas, as would happen to all fads, the craze over panoramic paintings was nearing its end. So much so that the company went under, and Mesdag ended up buying his own panorama to save it. I thought the panorama was really interesting. It would have been so cool, back then! Even now, it’s actually still pretty amazing. But surprisingly (or actually, maybe unsurprisingly), in its heyday, there was opposition towards it from romanticists, precisely because it was popular. 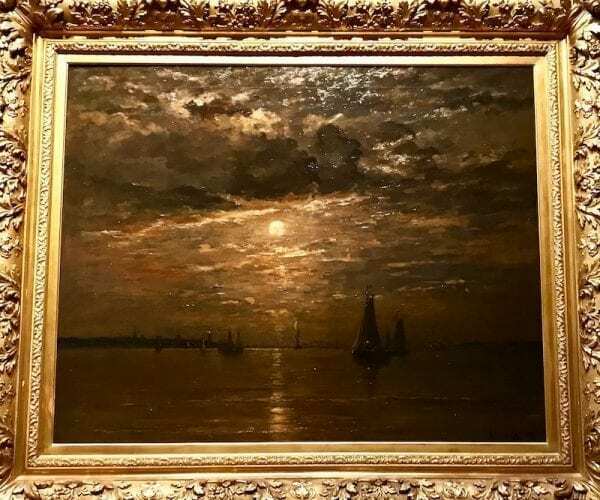 The complaint was that it brought sublime landscapes – supposed to be rarified and exclusive, according to the Romantics – down within reach of the layman. Apparently, ordinary people can live in nature that inspired Romantic art, and their folk culture are fit subjects of Romantic art, but their personal access to artistic work ‘taints the sublimity’. A bit snobby, really, if you ask me. No less than William Wordsworth himself decried the trend. He (and others) concluded that people were drawn to it because they were not smart enough to know it isn’t real. Rather than being proper art, it was just an illusion, a mere deceptive show. He believed that with the panorama doing all the imagining for them, people would become confused, unable to imagine the place for themselves. I can’t help but wonder what he would say about Instagram! A return flight between Kuala Lumpur and Amsterdam produces carbon emissions of approximately 8,224 lbs CO2e. It costs about $41 to offset this. Intrigued by Mesdag’s panorama too? Pin it for later! Next story Musical Clocks in Utrecht That Will Blow Your Mind!